Please contact for logistical inquiries as well. thyroid and cardiometabolic diseases in the Asia-Pacific region. Access resources by clicking on the Outcomes tab or scroll down to the Scientific Programme. Diabetes is one of the largest and most alarming health emergencies of the 21st century, affecting over 400 million people worldwide. A large number of people suffer from alterations in glucose metabolism resulting in impaired fasting glucose (IFG) and impaired glucose tolerance (IGT). These two conditions are also known as “pre-diabetes” because those affected are likely to develop overt diabetes in proceeding years. Managing patients with diabetes and pre-diabetes is a challenge when considering the pathophysiological complex pathways underlying glucose metabolism disorders. Deep knowledge of pharmacological mechanisms allows for effective prevention strategies for diabetes among those with IFG/IGT and effective management of patients with overt diabetes. Thyroid disorders are among the most prevalent endocrine diseases, with significant impact on quality of life and increased risk of morbidity. Thyroid hormones regulate the homeostasis of various tissues and thyroid diseases should be promptly identified and adequately treated to avoid adverse clinical outcomes. According to the World Health Organization, high blood pressure (hypertension) is the highest risk factor for premature mortality, followed by tobacco use and high blood glucose. Worldwide, hypertension causes an estimated 7.5 million deaths per year and is a major risk factor for invalidating or lethal events including ischaemic and haemorrhagic stroke, coronary heart disease, heart failure and renal impairment. Effective treatment of hypertension is essential to reducing cardiovascular complications. Taken together, hypertension and diabetes share common pathophysiologic mechanisms, health outcomes and clinical issues that are often tough tasks to face in clinical practice. The CME conference “2017 Asia Pacific conference on cardiometabolic diseases management” , 22-23 April, Manila, Philippines is designated for a maximum of 8 (eight) hours of European CME credits (ECMEC). Each medical specialist should claim only those credits that he/she actually spent in the educational activity. EACCME ® credits are recognized by the American Medical Association (AMA) towards the Physician’s Recognition Award (PRA). To convert EACCME ® credit to AMA PRA category 1 credit, please contact the AMA. 15.10 Pre-diabetes: is intervention a good option? 17.00 What can we do when insulin is not an option? 08.30 L5 Tachycardia in hypertension…What is the fuss about? 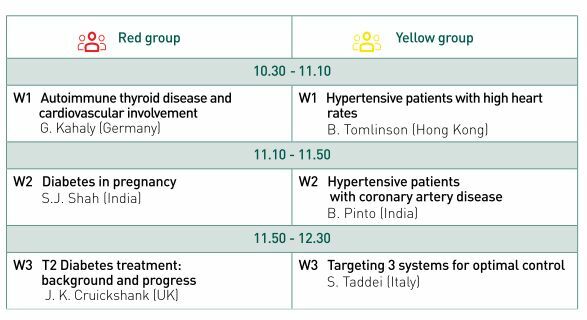 Participants will be divided into groups in order to let endocrinologists and cardiologists follow different workshops in parallel. Tachycardia in hypertension…What is the fuss about?